David Edward Foley was born on February 3, 1930 and died on April 17, 2018. He was an American Bishop of the Roman Catholic Church who served as the third bishop of the Diocese of Birmingham, Alabama. Foley was ordained a priest for the Archdiocese of Washington on May 26, 1956. He was appointed by Pope John Paul II the Auxiliary Bishop of the Diocese of Richmond in Virginia on May 3, 1986. He was consecrated on June 27, 1986. Pope John Paul II later appointed Bishop Foley the third Bishop of Birmingham in Alabama on March 22, 1994. He was installed as Bishop of Birmingham on May 13, 1994. 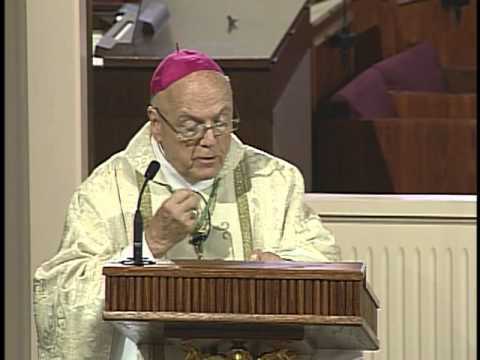 He retired on May 10, 2005, and was then elected Diocesan Administrator on May 19, 2005. Bishop Foley appeared on the Catholic television network, EWTN, whose studios are located in the Diocese of Birmingham, of Mother Angelica. Bishop Emeritus David Edward Foley, peacefully passed away this evening surrounded by friends at 7:01 p.m at St. John Vianney Residence for Priests in Birmingham. He humbly requested the faithful pray for him. Arrangements will be posted when finalized.